Chinese takeout is notorious for being full of sodium. Between the sugar and sodium-laden sauces, breaded meat, egg rolls, and fried rice, a takeout meal can quickly add up when it comes to saturated fat and salt. A better option is to make your own at home. It may seem intimidating at first, but it's actually pretty easy and doesn't require too many ingredients. 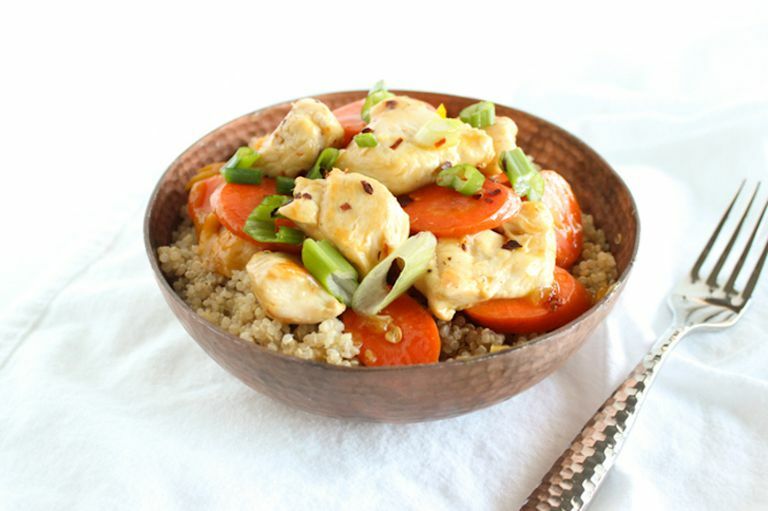 This recipe for spicy orange chicken uses fresh orange juice, garlic, ginger, and red pepper flakes for tons of flavor without added sugar or salt. The only sodium comes from a little bit of reduced-sodium soy sauce, which research shows can actually reduce the amount of sodium in dishes without affecting flavor. Searing the chicken instead of breading and frying it and adding plenty of carrots makes this dish even more virtuous. Serve this dish with a side of cooked brown rice or quinoa and top with sliced green onions and red pepper flakes for a super-easy version of takeout that is much healthier. It all comes together in less than 30 minutes—perfect for weeknight dinner! Heat oil in a large nonstick skillet over medium heat. Add chicken, stirring occasionally so that all sides get browned. Once chicken has browned, add carrots and cook, stirring, until carrots are softened, about 5 minutes. Pour in sauce and cook until sauce is thickened, 3 to 5 more minutes. Spoon into bowls with rice or quinoa and sprinkle with green onions and red pepper flakes. To bulk up this dish even more, add more veggies like broccoli, snow peas, or cabbage. For a gluten-free version, use low-sodium tamari instead of soy sauce, or look for gluten-free soy sauce. For a grain-free version, use low-sodium tamari instead of soy sauce or arrowroot (or tapioca) starch instead of cornstarch and serve with cauliflower “rice." This dish comes together quickly, so make sure your ingredients are chopped and prepped ahead of time to make cooking go more smoothly. Each serving is about 1 1/2 cups chicken over 1/2 cup quinoa.